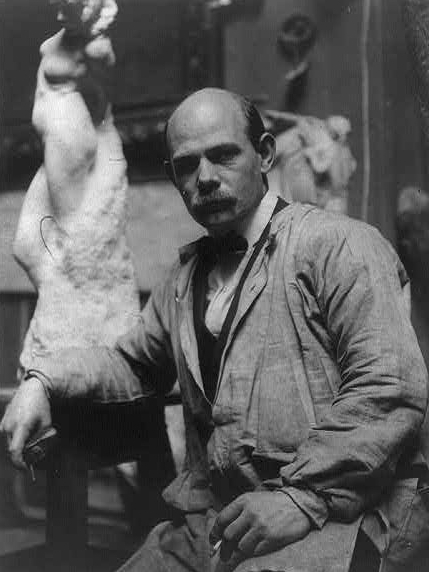 Noted American sculptor Gutzon Borglum (1867-1941) envisioned and directed the carving of what would become Mount Rushmore National Memorial between the years of 1927 until his death on March 6, 1941. 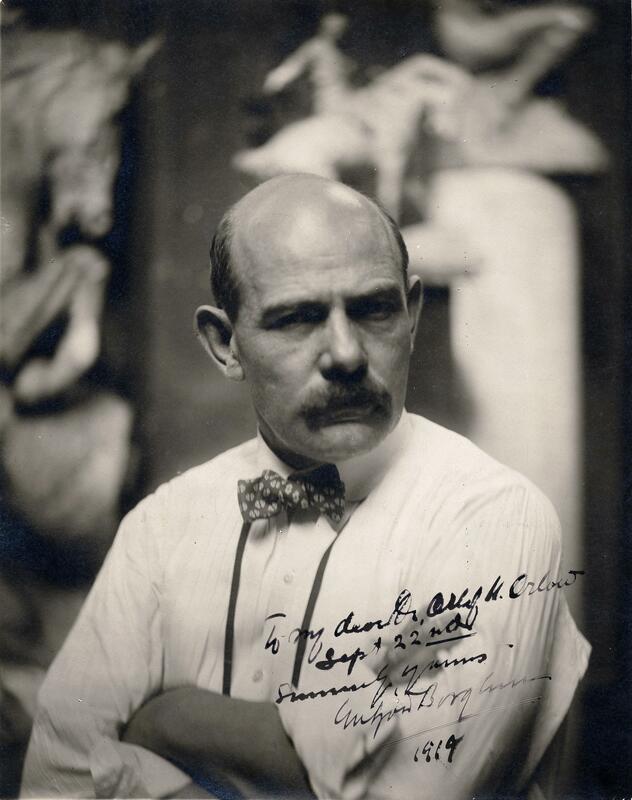 John Gutzon de la Mothe Borglum was born at Ovid, Idaho on March 25, 1867. Borglum decided on design and art as his means of livelihood at an early age. Through a series of fortunate and deliberate circumstances, Borglum had established a name for himself in the art world by the time he was in his early thirties. He had become well acquainted in the art circles of America and Europe by the time of the First World War. Borglum began planning for a memorial to Confederate Civil war heroes in Georgia in 1915. Actual work did not begin until 1922, and abruptly ended in 1924 when Borglum and the various parties parted company on the project. Borglum had actually been fired, partly because he had taken time off from the Stone Mountain carving to examine a similar idea proposed in South Dakota – a proposed tribute to Union heroes. This act by Borglum did go over well in the Heart of Dixie! In his respected career as a sculptor, Borglum’s name would become synonymous with the granite mountain deep he chose to carve in the Black Hills called Rushmore; although it was not his idea to begin with. Doane Robinson, the State Historian for South Dakota, first suggested the concept of carving a gigantic sculpture in the Black Hills in the early 1920s. Robinson and South Dakota’s U.S. Senator Peter Norbeck invited Borglum to visit the Black Hills to study this idea. Convinced of the immense possibilities of the carving, Borglum and his family moved to the Black Hills to supervise the sculpture’s design and construction. He decided that the likenesses of four American Presidents that had been instrumental in the creation of the nation would be carved from the granite outcropping near Keystone. Many persons, both locals and nationally, were skeptical of Borglum’s plans to carve on an obscure mountain in South Dakota. The first figure to emerge from the granite was that of the country’s first President – George Washington. In creating Mount Rushmore, nearly 500,000 tons of rock was removed by either blasting with dynamite or chiseling with jackhammers and pneumatic drills. Borglum and his hardworking crews began to accomplish the improbable on the mountain. Throughout this operation, many problems arose, as the blasting on the mountain exposed layers of granite that were of poor quality. Consequently, this necessitated the moving and turning of some of the figures. One example is that the figure of Thomas Jefferson was originally planned to be on Washington’s right, but was moved to his left. In February 1929, the U.S. Government created the Mount Rushmore Memorial Commission, with $250,000 appropriated for construction. Much of the credit for the Government’s backing of the project is attributable to Senator Norbeck. In Washington, D.C., Norbeck was a passionate and influential supporter of the Mount Rushmore project all during the 1920s up until the time of his death in 1936. Other than Borglum’s contribution, it is widely acknowledged that Rushmore would not have been created without the involvement of Norbeck. On July 4, 1930, the figure of George Washington was dedicated, symbolizing the founding of the United States. On August 30, 1936, President Franklin D. Roosevelt dedicated the figure of Thomas Jefferson. On September 17, 1937, the figure of Abraham Lincoln was dedicated on the 150th anniversary of the adoption of the U.S. constitution. And the last, Theodore Roosevelt, was dedicated on July 2, 1939 on the 50th anniversary of South Dakota’s statehood. Borglum died on March 6, 1941. Completion of the sculpture was then turned over to Borglum’s son Lincoln. The work was finished six months later. The total cost of the project was just under 1 million dollars. The death of Borglum and the beginning of the Second World War cancelled any formal dedication plans for the monument. Because Mount Rushmore was never formally dedicated upon completion, President George H.W. Bush participated in a formal dedication on July 3, 1991, which coincided with the 50th anniversary of the completion of Mount Rushmore. The result: America’s Shrine of Democracy. The symbolism of the Monument is just as powerful today as the day it was completed, and its dimensions are equally as impressive. The elevation of Mount Rushmore is 5,725 feet. Each figure is approximately sixty feet in height, and the entire monument can be seen from a distance of roughly sixty miles. Borglum’s perceived folly has become a national treasure.